It’s the end of July, and Meagan and I were scheduled to meet for our monthly writing session. We chose a new place to eat on Sunday, and surprise, it was a order and go sit kind of place instead of a restaurant with actual waitstaff. As a result, we had a lot more time to kill than usual before we could head off to the library. Did we sit and chat about our lives while eating copious amounts of yummy queso? Of course. Did I show off my writer charm bracelet that I’d made and had worn for inspiration, and smile when it tinkled? Yep. Did I dig into my laptop tote that I brought inside with me because I didn’t want my chocolate covered raisins to melt into a big blob of ickiness while sitting inside my trunk in the Texas summer heat to find that tiny little pouch containing my writer’s blocks? You betcha. We spent the next half hour or so rolling those little dice onto the tile tabletop of our booth and seeing how they landed. We laughed at some options, and I groaned each time ‘horror’ popped up. 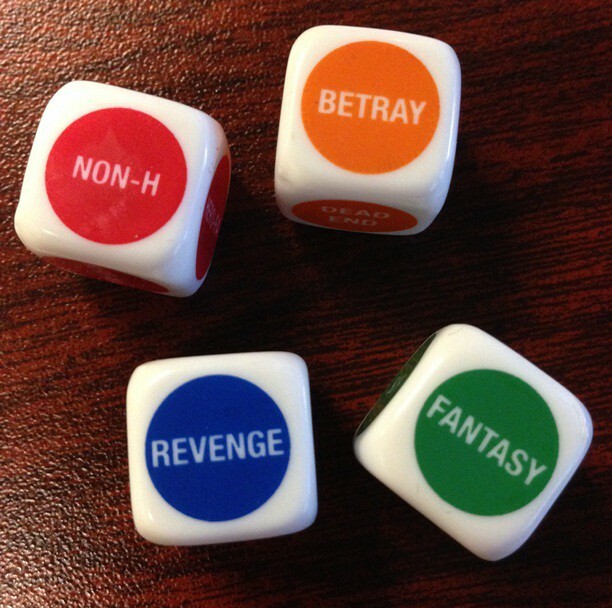 I started handing Meagan the die that rolled an option I didn’t like for her to do the re-roll, and she the same. By the time we left, I had seven options to choose from and she five. This then prompted a discussion as to what constituted a non-human. I made the argument that alien non-humans fell more into the scifi category, and supernatural creatures such as vampires and werewolves would be non-humans in a fantasy world. She gave me an “uh huh” and ignored me to work on her own story.